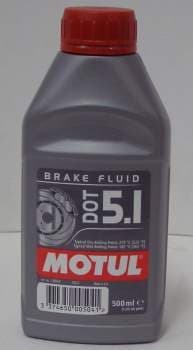 Motul Abs5.1 Brake Fluid - Circle Track Supply, Inc.
LONG LIFE 100% Synthetic Fluid for Hydraulic Brake and Clutch Systems. DOT 5.1 NON-SILICONE BASE. The high wet boiling point (185°c/365°F), superior to DOT 4 and DOT 3 fluids enables to use this product longer. Its viscosity (820 centipoises at -40°c / -40°F) lower than DOT 4 and DOT 3 brake fluids, allows MOTUL BRAKE FLUID DOT 5.1 an easier fluid circulation in micro-valves of anti-locking systems. 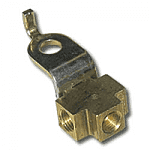 Perfect for Cold Operating environments. 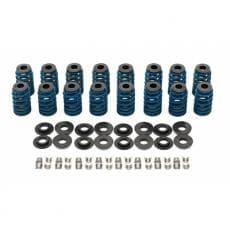 PERFECTLY NEUTRAL WITH SEALS USED IN BRAKING SYSTEMS. Available by the 1/2 Liter bottle, in six-packs or economical 12 bottle cases. Due to the extreme operating temperatures of a high performance brake system, standard 'off-the-shelf' brake fluids are not recommended. It is of critical importance in determining a fluids ability to handle high temperature applications is the Dry Boiling Point and compressibility. Brake Pedal Fade can be caused the brake fluid Boiling and turning into a Gas vapor and then returning to a solid state when it cools down causing moisture introduction and the continued dropping of the Wet boiling point. So we recommend you change your race car’s brake fluid on a weekly basis. The collected moisture will boil causing vapor lock and Brake system failure. 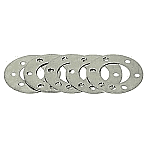 There are many ways for moisture to enter your brake system. Condensation from regular use, washing the vehicle and humidity are the most common. Glycol based DOT 3 & 4 & 5.1 fluids are hygroscopic; they absorb brake system moisture, and over time the boiling point is gradually reduced. We do not recommend using DOT 5-Silcon Fluid in any racing applications. DOT 5 fluid is not hygroscopic, so as moisture enters the system, it is not absorbed by the fluid, and results in beads of moisture moving through the brake line, collecting in the calipers . It is not uncommon to have caliper temperatures easily exceed 200 F, and at 212 F, this collected moisture will boil causing vapor lock and system failure. Additionally, DOT 5 fluid is highly compressible due to aeration and foaming under normal braking conditions, providing a spongy brake feel. DOT 5 fluid is best suited for show car applications where it’s anti-corrosion and paint friendly characteristics are important. Whenever you add fresh fluid to your existing system ( never mix fluids of different DOT classifications), it immediately becomes contaminated, lowering the boiling point of the new fluid. For maximum performance, start with the highest Dry Boiling Point available, flush the system completely, and flush it regularly, especially after severe temperatures have been experienced. We recommend Motul 600RBF as an excellent fluid for all Hi-Performance applications.